Consumers are spending $65 more a month to fill-up compared to last summer. According to AAA, gasoline expenses are accounting, on average, for seven percent of an American’s 2018 annual income, a one and half percent increase since summer of 2017. 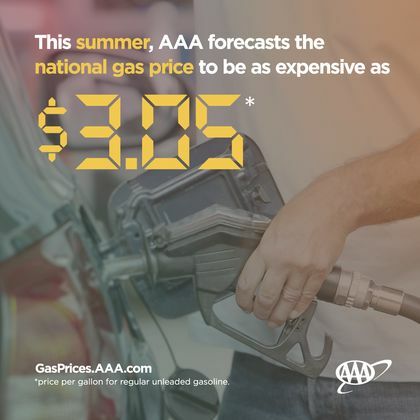 With strong summer consumer gasoline demand expected in the months ahead, AAA says motorists can expect little relief at the pump with the national gas price average ranging between $2.85 - $3.05 through Labor Day. Demand - According to the EIA’s latest reading for consumer gasoline demand, March 2018 saw nearly 9.45 million b/d, representing the strongest demand measurement for a March on record and a one percent increase from last year. AAA expects the high and potentially record-breaking consumer demand trend to continue through the summer, pushing prices higher.